We live in an enlightened age of beer, which is perhaps the best time ever for beer in America in terms of diversity, quality and innovation. If, however, you’re one of the unfortunate souls living today in Alabama, only 1/3 of the beers made in the world are legally allowed to be sold there. The Yellowhammer State is determined to keep its beers yellow and fizzy. Only beer under 6% abv is legal there and only in packages holding 16 oz. or less. As you might expect, wine has no size restrictions and can be up to 24% and spirits none whatsoever. There are other odd restrictions, too, such as homebrewers are not permitted to hold competitions. The fact that homebrewing is even legal, I confess, is almost surprising in and of itself. For a more complete picture of the antiquated restrictions in Alabama, visit Free the Hops. 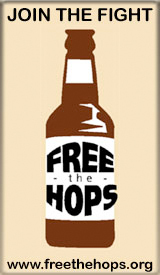 Free the Hops is a grassroots organization that started in 2004 that’s trying to drag Alabama’s beer laws into the 21st Century and, sadly, they’re meeting with a lot of resistance from … well, let’s say folks who would rather keep the status quo, don’t really understand what’s happening in the rest of the world, and would rather Alabamians stopped drinking altogether. Despite these hurdles, and with the support of 61 businesses in the state, they’ve managed to get their “Gourmet Bill” through the house and the state senate is poised to vote on it later this week. As you might imagine, such effort needs money. To raise some funds for the fight, Free the Hops is conducting a raffle of rare beers at only $4 per raffle ticket, 3 for $10 or 5 for $15. There’s a special raffle website where you can buy raffle tickets online using credit cards or PayPal. It couldn’t be easier and it’s for a very worthy cause. I just bought five tickets. Who’s next? Let’s help Alabama to enjoy more of the wonderful beers we take for granted. Moving from Oregon back home to Alabama was an eye-opener . . . There is actually a decent variety of beer in Alabama, but only within the sad, sad restrictions you mentioned. Thanks for doing this. Let’s hope the legislature sees it through. I talked to some folks from this deprived state at Dark Lord Day. I am sympathetic and stand behind them! It seems amazing to me that Alabama still has some really outdated beer laws. Lets hope that together we can change them.